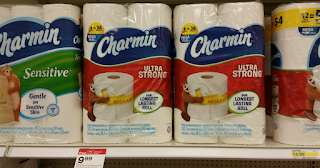 The Target Saver: Target:Charmin Ultra Soft Bath Tissue 16ct- $5.66 ea. Target:Charmin Ultra Soft Bath Tissue 16ct- $5.66 ea. Final Cost $16.97 total – just $5.66 each! Final cost $18.22 total – just $6.07 each!